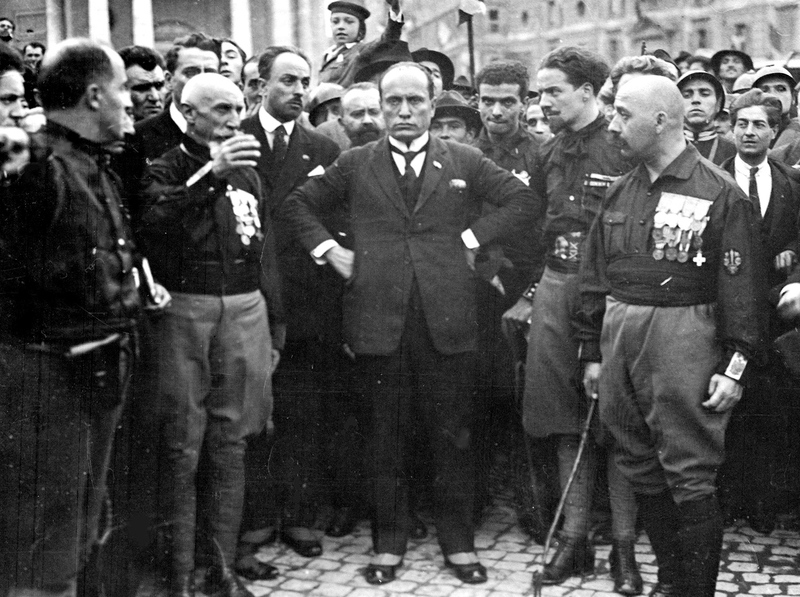 On June 10, 1940, Mussolini led Italy into war with the Allies. Winston Churchill’s snide response to Italy’s participation in the Axis was, roughly, “It’s only fair. We had them the last time.” Hitler sneered that “First they were too cowardly to take part. Now they are in a hurry so that they can share in the spoils.” It takes some doing to get those too deadly foes ridiculing you at the same moment. But Italy’s declaration of war was indeed a move as squalid as it was futile and an object lesson in deluded belligerent sleaze. Somewhere I read a line attributed to Kipling, though I’ve never been able to confirm it, that if you go into the jungle you must know what size beast you are. (If anyone knows the source, or can definitively debunk it, please let me know.) But whoever said it, clearly Mussolini did not take heed. Indeed it’s curious to reflect, in retrospect, on how fascist Italy was seen as a great power in the 1930s on a par with Germany, perhaps more dangerous, and Mussolini a totalitarian theorist at least as important as Hitler. Certainly Mussolini took the lead in testing the democracies’ resolve, attacking Ethiopia in 1935 and taking a major role in the Spanish Civil War, and helped show Hitler that it was wanting. He looms surprisingly large in Churchill’s The Gathering Storm . But it didn’t take a long time for Hitler to push his hapless Italian colleague into second place and indeed, after Italy’s 1940 collapse in North Africa and bungled invasions of Greece and Yugoslavia in 1941, to see him and his military correctly as more of a liability than an asset. It isn’t even obvious that Italian participation in the fall 1939 and spring 1940 campaigns against France would have been any help, while in June 1940 their failure to break through French defences was risible without being significant. On the other hand, it brought swift condemnation from American president Franklin Delano Roosevelt, whose commencement address to the University of Virginia (including his son Franklin Jr., from the University’s law school) declared indignantly that “On this tenth day of June, 1940, the hand that held the dagger has struck it into the back of its neighbor” and pledged all possible material support for Britain and France, pretty much declaring an end to American neutrality. In that sense, by having no clue what size beast he was, Mussolini did the Axis cause far more harm than good by joining, convincing FDR and many Americans that the gathering storm was more ominous and threatening to them than they had realized. Later, when informed that Romania had declared war on the United States shortly after Pearl Harbor, Roosevelt would ask “Did you ever hear an ant fart in a windstorm?” But at least Romania had the feeble excuse of having no real choice. Had Mussolini kept Italy out of the war, successfully continuing to pose as a statesman, he wouldn’t have wound up hanging from a meathook in 1945. Like Franco, he might have enjoyed an unsavory reputation and a long reign. As for Italians, well, their country’s sound defeat by the Allies followed by a decision to blame the regime not the people, aided by enthusiastic Italian efforts on the Allied side from September 1943 on, worked out pretty well. Today Italy is solidly democratic if not exactly a model of public efficiency, with the third largest economy in the Eurozone. Italians’ decision to allow Mussolini to take power and throw Italy’s lack of weight around could have gone far worse for them, perhaps ironically had he managed to do more harm. But it is amazing how everyone misjudged Italy’s geopolitical importance under the rule of an archetypal dictator, most dramatically that dictator himself.